This is is just a minor observation about the wind gods found on K1485 and the Yaxchilan hieroglyphic stairs. In slash and burn agriculture, you have to have a good burn in order to produce a successful crop. To produce a good burn, there has to be a steady moderate wind when the field is fired. Once the fire gets going, it creates small whirlwinds that dance across the field as they pick up ash, smoke and flashing sparks. In Yucatan, they are called kakal mozon ikob “fiery whirlwinds”, and they are thought to create a good burn. In some prayers, they are called red wind, white wind which may be related to the red cinders and white smoke/ash. The farmer whistles while firing his field so that these winds will come. The belief that whistling will cause the wind to come is found across the Maya highlands as well. 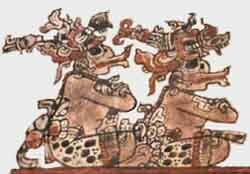 Although the lips on the wind gods do look similar to Ehecatl’s duck bill, I think it is a good possibility that these wind gods have pursed lips because they are whistling.